Gate 26A is now closed. From I-70 exit 41, take Route 235 south. About a mile south on 235, the road will exit to the right and pass back over route 4. Just follow the 235 signs. Turn right at the first traffic light and follow that road around the base to the main gate 12A (open 24/7). After entering the gate, go to the stop sign, turn left on Spruce Way. Follow it around and it becomes Skeel Ave. Follow Skeel until it becomes Loop Road. Follow Loop Road around the NE end of the runway until you get to the FamCamp. ---- From I-675 north bound, just follow the directions from the Interstate. If you do happen to come in gate 15A, just continue straight which will take you around the flight line. Accepted up to 6 months in advance. A one night, non-refundable deposit is required. Highly recommended. 14 day stay limit that can be extended based on availability. They warn campers of very low water pressure. Not all sites have sewer. If paying by cash or check, there is a drop box in the door at the end of the community center building near the campground by the lake. If paying by credit/debit card, you have to go to building 95 (Outdoor Recreation) or pay by phone. Office hours are 0830 to 1500. They are short staffed, so phone messages make take 24 hours to be returned. Very close to the Air Force museum. Base Map w legend to all major facilities. Really helps find Outdoor recreation, Bldg 95, #15 on the Area-A map, where RV site payment, etc takes place. Also provides gate locations and their number. The previous reply must have a beef with new management or someone. This place has improved tremendously since Larry and Vicki took over managing it. Slowly improving things. New electric posts at sites, not all done yet. New picinic tables at all sites, no more concrete benches and tables. All sites have new posts with boxes that they put the name of Reservation and check in, check out. WIFI has improved greatly from 2 years ago, yes it could be better, but it's better than most campgrounds we have stayed at, might need an extender to pick up the signal better. The price of $25 is still good, Famcamps nationwide have been raising their rates and this one is still better than some of the others that are $30 to $35. 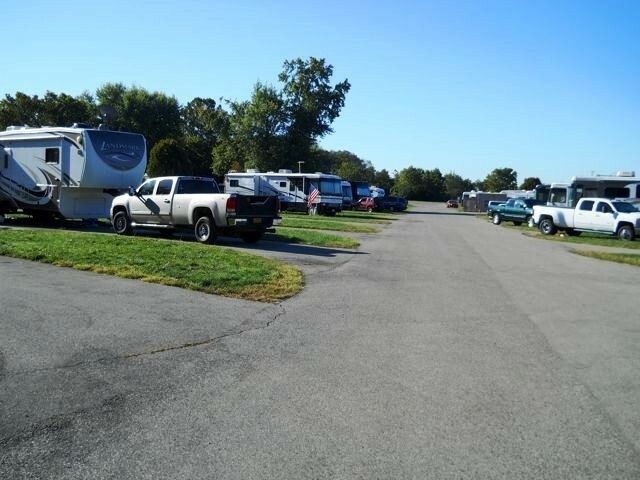 Private RV parks are in the $40-50 range now. I don't remember anyone managing this campground in the past, I think some people became self appointed managers and if I remember correct, created some of the problems. Homesteading doesn't appear to be as bad as it was in the past. 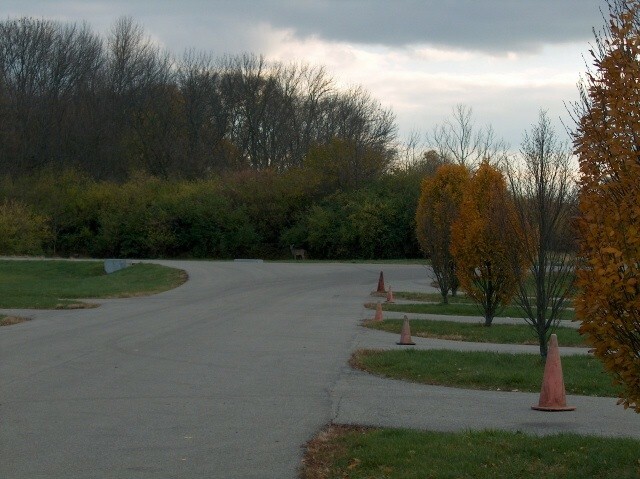 The grass and campground was in shambles 4 or 5 years ago. It has come along way since. Most sites are level, some will pool water during heavy rains. Electric and bathrooms are good. Also, no all Famcamps have dog runs or playgrounds. This place is great for the Museum and area and price is right. Reservations recommended. The hidden Gem of Gem City is tarnished...the overall cost of WPAFB FAMCAMP is now too high IMHO. This used to be a very reasonable campground that charged about $17/night. New policies in place and the nightly rate has skyrocketed to $25/night. The overall cost doesn't sound ridiculous, but the campground doesn't offer much of anything in the way of amenities. The only thing going is free electric and you get to hear the National Anthem played every evening at 1700. There are no playgrounds, there are no dog runs, the water pressure is beyond poor, and you can't even fully enjoy Bass Lake because the floating dock is submerged because the contractor didn't build it right during the last fix. They do have decent bathrooms with showers, and there is a small laundry facility on site, and they do have a very limited WIFI connection (you have to be sitting right outside the shower house to get a signal). 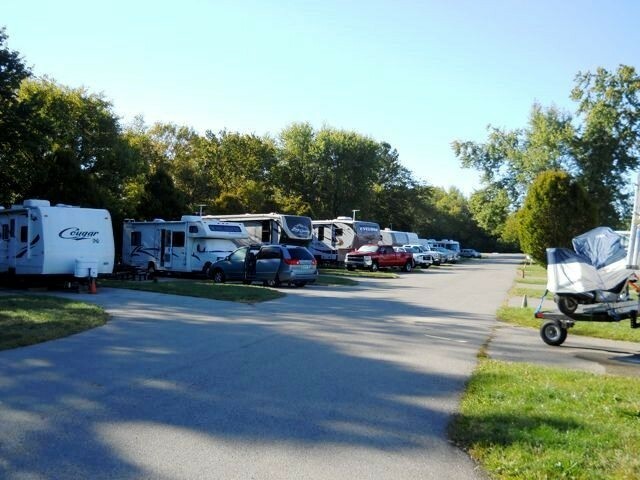 We enjoy the company of folks who stayed at and managed this campground in the past. We frequent this campground to visit family in the local area almost yearly, so it pains me to see it heading this route. I'm sure a few of our friends are still camping and working at the campground as well. We even helped maintain the campground by cutting grass and helping with landscaping when we stayed here in 2016. The sense of community and the amount of effort folks put in to keep the campground looking good and being a friendly place to stay was remarkable. The sites are ok, not the most levelest as water can pundle if u have one of those site and days. The week I stayed Dayton broke its coldest temp, new one is -7. That being said the water did freeze up, if I would have had enough water in my tank i would have been fine. I just used the bath house which was very clean. On my site I never did get water so I ran hose over to the next site, which was working, I believe my water handle was inop, no biggy. Getting on base can be tricky, just use main gate off. 444 and Chidlaw Rd,which enters the base, next look for Mitchell Rd and Riverview Rd, you’ll see the campers from there. Reading directions can be confusing so just find these points and use ur google map. This is truly a HIDDEN GEM......Once we got to the base, we drove around for an hour looking for family camp. Recommendation.... raise the rates a couple bucks and buy a couple signs to put out on the road to guide people in. The facilities are outstanding...……………………. Once people find you. 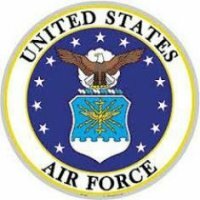 WPAFB Famcamp is very hard to find! Beware, no GPS, follow directions carefully. Not sure this park is worth the price. And, website says length or stay is 2 wks but many talk of staying much longer. Which is it? Very very hard to find this campground. The gate we were directed to was not open and we drove around for another 30 minutes looking for another gate. Host were very accommodating. This place is at the very end of the base and you could not have put it any farther away from the exchange and commissary. Played golf at one of the two base courses and found it to be expensive ($42) for 18 holes and a cart. This was not a $42 golf course. Enjoyed our time here. Camp host welcomed us and provided a map and information on places to go while here. It was nice taking a nice warm shower even though we have one in our RV. The sites are clean but close to each other. Overheard possible new sites added for more larger big rigs which would be a plus. Famcamp sits way in the back next to the flight area but I love solitude. Commissary had everything I needed and a big plus was the Starbucks on site. We will defiantly come back here when in the area. We stayed in site 21 while we were there. Right after we got there it rained and most of that site flooded with 2 to 3 inches water then it froze and all my utilities froze to the ground and had to go out and buy a bunch of salt to get my hoses and power cable loose. Their is no fenced dog run area but had stands for dog poop bags. When I asked the campground host what the maximum stay was I was told 6 month but taking to a former campground that was there I was told that the maximum stay is 364 days. The spigots are not winterized so if you go there during winter make sure you have heat tape to put around the spigot. 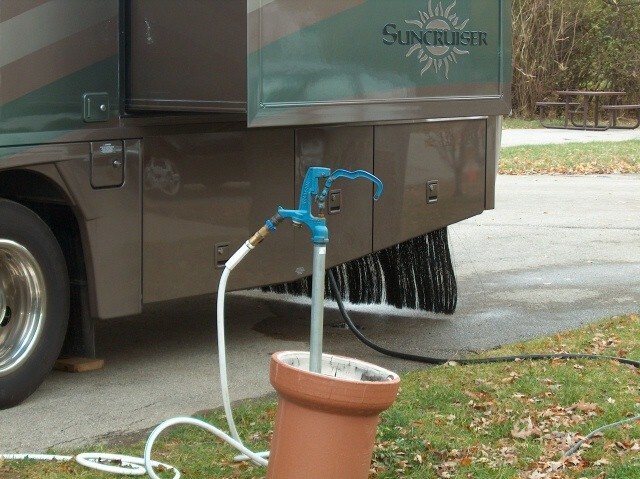 The only way you can get propane is to have the only company install a tank for you as they will not fill directly to your tanks on your motor home the other option is to take your motor home off base then come back and hook everything back up. Stayed here years ago. A great improvement from years ago. This place has improved. But does not rate a 5.0 as some have given on here. It is your average, in some ways below average, military camp ground. Host hubby and wife. Kinda over board. Lots of home steaders still living full time as it was years ago. 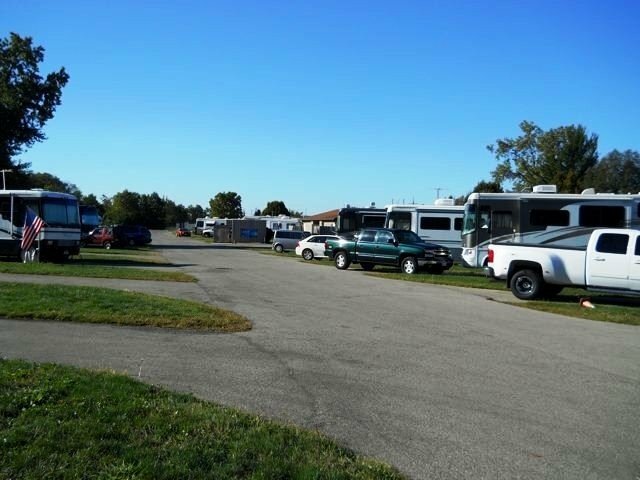 With increase of transient RVs about time the home steaders are told to move on after a 30 day stay? Some contractors in that homesteader mix. Few transient people had to rotate from full hook up to partial. There were a few dry camping as well. Should be indicator that time for the homesteaders to move on. Had two separate stays: one just before the Dayton Hamvention and the other just after. Both were excellent. Really enjoyed the camp ground and the hosts were excellent. Definitely will stay there again next time! We had stayed here a few years ago and weren't too impressed back then. What a difference a few years makes! The hosts, Larry and Vickie have done a great job cleaning and maintaining this FAMCAMP. Larry came over to greet us as we arrived for our 2 night stay, and invited us to a free Labor Day hot dog gathering the next day. The FAMCAMP now also has canoe and kayaks to rent and bikes. The restrooms were kept clean and the three washers and dryers were only $1 wash and 50¢ to dry. The sites are not very large but they are maintained nicely Trying to figure out what gates are open can be tricky especially on a holiday weekend. Check in advance and it will save you some grief and U-turns. Reservations recommended. Many active duty and contractors living here full time. Length of stay is 365 days. Park has had a steady stream of over-nighters. To extend you most likely will have to move around. There is a rotation going on for extended stay, in and out of partial hook-up sites to full hook-up sites and back again. Park Appearance: mowed. Trash picked up routinely. Asphalt pads with concrete patios are older. Utility boxes old. Women’s Shower/Toilets: Updated and clean. 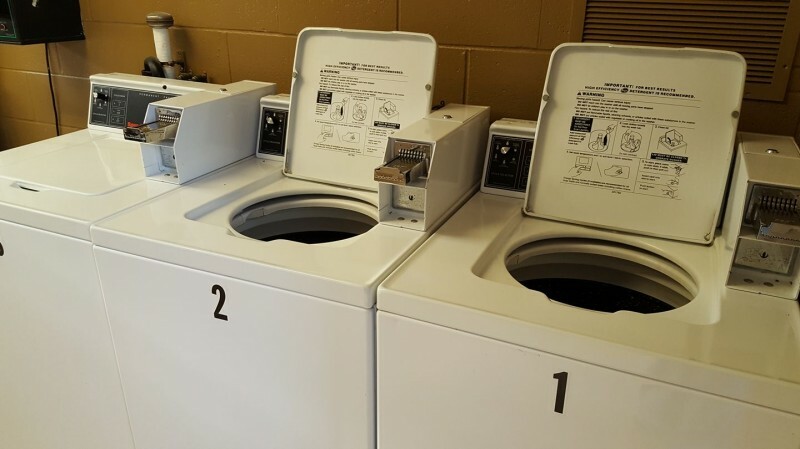 Laundry: 1.00/.50 wash/dry: Large top load commercial Speed Queen washers and dryers in good repair. Commissary: Large. Meat and produce selection large. Some Organic selections. Camp WIFI - One access point located on top of bath house. Slow, drop off rate HIGH, when you do gain access, it is extremely slow. This is one of the better Famcamps we have stayed at. When we left eastern Ohio it was raining and when we arrived it had just became spotty rain.the directions to the base are easy if going thru gate 26A (m-f 0800-1800) or 12A which is 24/7. Larry and Brooke came by as soon as we pulled into our spot,to ensure everything was okay and if we needed anything and finally to let us know about the activities going on for the memorial day holidays. The trip to the Air Force Muesum was quick,easyand our stay was very relaxing and enjoyable. Vickie, Larry and Brooke are interested in the appearance of the park and it's facilities and it shows.As we where leaving Brooke was out weeding and watering the flowers at the entrance to the park, I'd recommend this Famcamp to everyone. We changed our plans after leaving Arkansas and chanced a call to the Family Camp at Wright-Patterson AFB Bass Lake to see if there was room for one more. Left a message and were promptly given a call back by the camp host, "Vickie", who advised us that she had a site with partial hook-ups available, although they provide both, partial and full, with an added dump location nearby. We jumped at the chance because of the proximity to the USAF Museum and other attractions we wished to visit. We were able to follow the posted directions to the base as written without difficulty and were graciously met as we arrived by the camp host to show us the best way to back into our spot and turn around. Vickie, Larry and Brooke provide very clean facilities and are making improvements daily, recently adding canoe and kayak rentals for the lake. The camp hosts have been very instrumental in getting the camp fixed up into the gem it is today. Very clean facilities, lots of space and great to see so many visitors from all over the states using it. Reservations are accepted and recommended. Enjoy your stay, we have! Ed, Terri and Kona! Wow, we really enjoyed our visit! 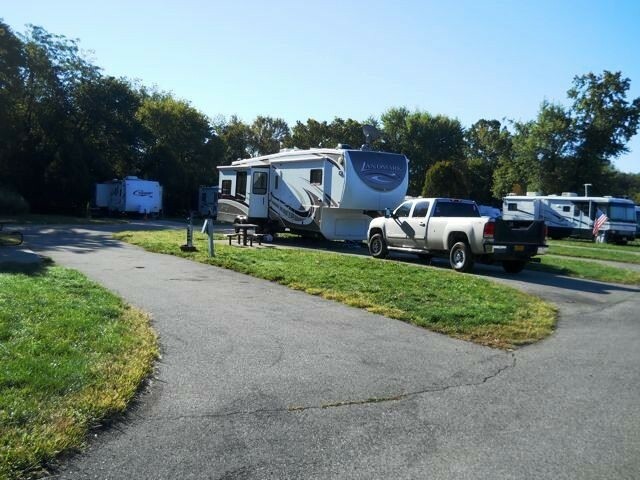 It is a smaller but very nice campground with much to do on site and in the area. The Camp Hosts, Larry & Vickie, are second to none and go above and beyond to make sure everything is prefect. There have been improvements since our last visit; i.e. WiFi upgrade and landscape cleanup and beatification. We plan to come back! While I understand that to each is their own, I don't believe we've stayed at the same place as the ones posting negative reviews because this camp, as well as the service, was (is!) FANTASTIC. Firstly, we arrived at midnight and settled in around one. In between that one hour span the hosts had helped us with a number of things and with the best attitude possible too!! They're honestly so darling. Anyways, Wright Patterson is colossal and not exactly well lit, so of course we found ourselves lost in the dark. But like the amazing hosts they are, they came to our rescue by finding us on that monster of a base and led us to Fam camp. But their kindness didn't stop there either. They even helped us back our trailer in despite the cold, windy weather and overtime they had been working. Throughout the ordeal they were patient and extremely polite, even afterwards. They even struck up conversation and gave pointers on a few things. Secondly, the camp itself was in great shape! Very clean with fresh cut grass. The grass was soft and always kept up with, as well as the rest of the campus. The bathrooms were cleaned everyday of every morning and evening. It was never a problem like some sites. So all in all, everything was great. Hats off to the lovely couple that runs it.